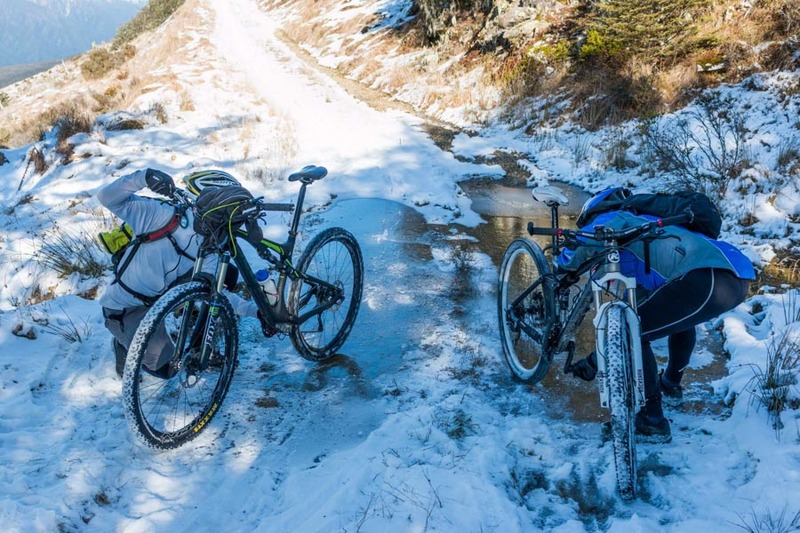 Mountain Biking’s on the up, and there are some amazing feats being accomplished in the Top of the South. 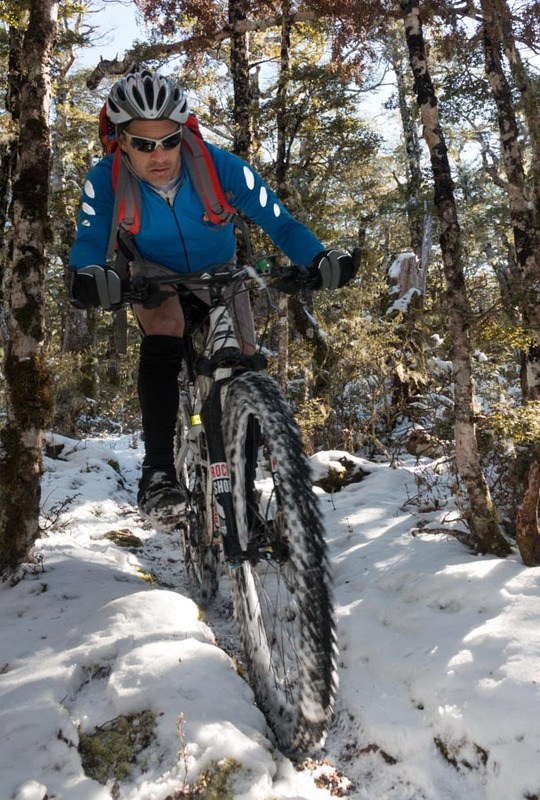 New trails are being built, communities are realising economic benefits, and the area (especially Nelson) is gaining international recognition. One organisation spearheading the construction effort is the MTB Trails Trust. One of the Trust’s goals is to establish the Top of the South as a mountain biking destination of choice. And judging by the quality of some of their recently built trails, they’re definitely on the right track. Maitland Ridge is an example of such a trail. Maitland is accessed via Tophouse road, a few kilometers from St Arnaud off State Highway 63. I had ridden it once before, but the weather and visibility were so appalling that I hardly saw a thing and concentrated on simply making it home without frostbite. The day of the planned second assault was the polar opposite – brilliantly blue and crystalline clear. Snow sparkled off the encircling peaks of the St Arnaud and Raglan Ranges. The trail begins on a 4wd road with a serious ascent of 600 metres (to a high point of around about 1300m). My internal temperature was rising rapidly but was countered by the ever increasing blanket of snow. As we pushed onwards, the snow thickened and staying upright became a challenge. In these conditions I was wishing for chunkier tyres, with my Maxxis Crossmarks constantly waving the white flag. I was being punished by my dismounts, with huge efforts needed to get rolling again. So it was with relief when the road began to flatten out and we arrived at the large orange triangle where the road veers into singletrack. The fun stuff was about to begin. The singletrack is rated as Grade 4+, meaning the trail is narrow, with poor traction and obstacles that are difficult to ride or jump over. 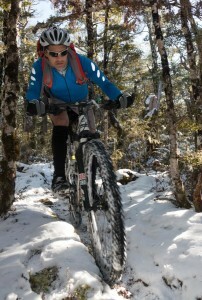 The Marlborough Mountain Bike club had an outing here, and a number of the riders had to do a lot of walking. Suffice to say, you need to be reasonably confident and competent to tackle this ride. But if you are those things, then the rewards on offer are huge. The trail twists, it weaves, it drops, flattens, drops again, turns sharply – watch that off-camber switchback – rises briefly, coiling upwards, straightens and plummets again. It seems to have a life of its own, and like all mildly dangerous singletrack, it eggs you on, taunts you for your cowardice, and then, when you clean a section elegantly, it congratulates you for your god-like mountain bike skills. Or so it seems. But the point is, like all good mountain biking, it elicits a mammoth grin, gets the adrenaline flowing freely, and makes you oh-so glad to be alive and thankful you’re not at home on the couch or in front of the Play Station. 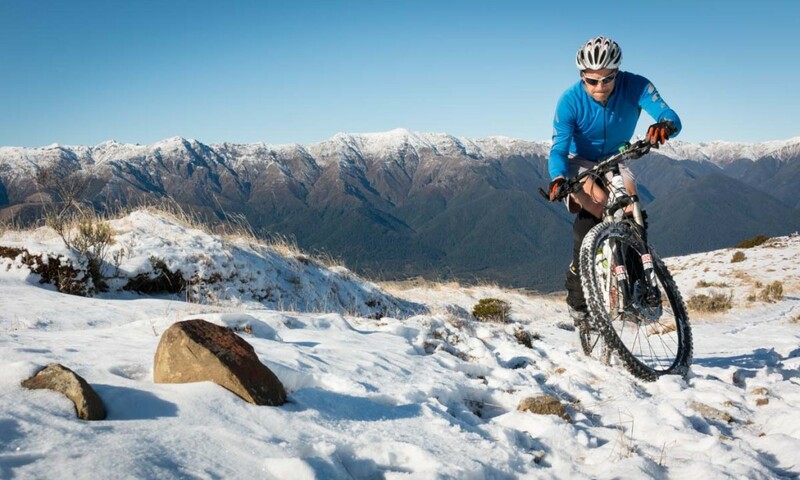 The native forest is interspersed by stunning views across the Wairau Valley to the towering ranges, providing perfect possies to stop and gush about the ride, or just take in the magnificent Marlborough seclusion. But before long you’ll want to keep trucking on and continue to marvel at the sheer quality of this amazing singletrack. The termination of the track is signaled by a fast rocky descent that ends at Red Hills Hut. We arrived at the comfortable little DOC retreat wearing those silly grins and immediately started chattering to each other about certain aspects of the trail; “I can’t believe I cleared that!”, or “I had an awesome crash there”, or “I rode that descent on one leg!”. Basically, it’s just a whole lot of fun. After some lounging in the sun (the snow was now a distant memory), we blasted down the southern side of the Red Hills towards the ride’s end. A fast gravel road culminates in a brief stretch of technical singletrack just prior to the Red Hills carpark. And then it’s over, and you can give yourself a big pat on the back. 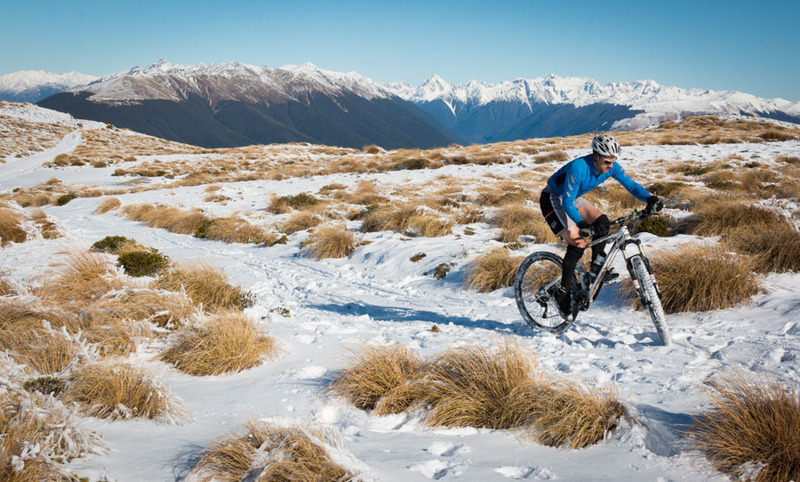 You’ve just experienced one of the best back country rides in Marlborough. Thank you MTB Trails Trust! I’d recommend parking at the Red Hills Hut carpark on SH63. That way you get the 15 minute road ride out of the way early. The track is marked by large orange triangles. Allow 4-5 hours for the 22 km round trip, but if you’re fit and in a hurry you might manage it in half this time. You can also continue up the 4wd road to the summit of Beebys Knob, which affords magnificent views of Nelson Lakes and the surrounds. Add a couple of hours return for this. Water can be obtained from Red Hills Hut. This ride is in a secluded alpine location. Think very carefully before riding it alone.